I'm considering transitioning the blog to a mainly investing and technology focus, because that's mainly what I talk about and have been focusing on. I still enjoy the five topics of MITCH - minimalism, investing, technology, conversation, and health, but it may be too many topics to do them all justice. On that note, I projected out how many dividends I'll receive in 2019 from my Robinhood Portfolio. I'm projecting to get $150.76 of income from the dividends/ETFs that I currently own. With that money, I will buy additional dividend-paying stocks/ETFs, so the actual amount will most-likely be higher. I will also be adding some money out of my pocket, probably from my tax return this year. What is cool to see is that right now, the end of December 2018, I'm just crossing $100 in dividends, while next year, I'm projecting over $150 in dividends. Below is a table of the dividends I've received by month. The yellow cells indicate an incomplete month/projected month. You can see that every month in 2019 is projected to be higher than 2018. Projections don't always yield the exact results, but I think it'll be pretty close. How are your dividends looking for 2019? Here is my overall year-to-date update. I'm one quarter away from reaching $100.00 in dividends for 2018! I will for sure hit that goal this coming Monday, when I have 12 dividends scheduled to be paid. I have $15.32 in buying power, and I'm not sure what my next stock purchase will be. Right now on my watchlist I have Procter & Gamble (PG) and Ally Financial (ALLY). I would be able to purchase Ally sooner than PG because Ally stock is currently at $22.50/share compared to PG at $91.29/share. PG currently has a higher dividend though. I won't be making any more stock purchases this year and ALLY and/or PG will have to wait until 2019. Did anyone else struggle going to work today? I acknowledge that I'm pretty fortunate to have a job where I get Christmas Eve and Christmas Day off as company holidays. The four day weekend was fun, but I got back into poor sleep habits and probably only got five hours of sleep last night. Anyway, it was nice to get back into a routine at work. Continuing on with my end of 2018 financial to-do list, I looked at my reoccurring payments. Do I use this? - Yes, almost every day. Do I need this? - I would argue yes. I use rain and ocean wave music to fall asleep, and I sometimes you feel better after listening to music. Do I use this? - Every. Single. Day. Do I need this? - 50/50 - My family needs it, but I don't necessarily need it. Do I use this? - Not too much right now, as you can see, I'm pretty big on Google. Do I use this? - Not nearly as much as I used to. Do I need this? - Not anymore since I bought a 2 TB external hard drive. Do I use this? - Not really anymore. Do I need this? - Yes, for my pictures. Do I use this? - I take a lot of pictures. Looks like I can consolidate and cancel Apple iCloud Storage and Dropbox and save $20/month right there. This is a good exercise to review reoccurring costs, and I encourage you to look at your reoccurring costs! Part of the last few things I wanted to accomplish in 2018 from a financial/investing lens was to sell off my cryptocurrency. 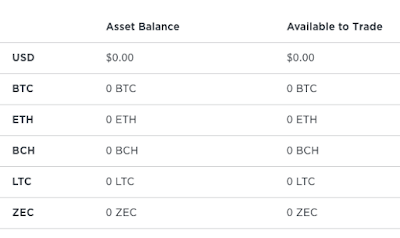 I worked on selling the small amount of cryptocurrency I had in Gemini, and here is a screenshot from my Gemini account showing that I've sold and withdrawn everything. I had a TERRIBLE rate of return on cryptocurrency. I initially put $100 into Gemini to try it out and I withdrew around $20. I averaged down on Ethereum a lot, and lost quite a bit of money there. 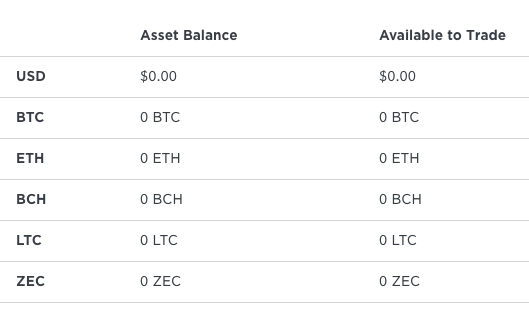 Another example was that I bought $10 of Zcash and sold it for $1.96. It was fun to try and I'm glad I did it, even though I lost money. I was hoping to do some swing trading, but that didn't work out for me. Do you have Cryptocurrency? How are your investments going? I have Cryptocurrency in two different (brokerages?) I'm not sure if you call them brokerages, but two different sites/companies. Cryptocurrency was fun to look into this summer, but with the dropping price, I'm pulling what few dollars I have left out. I was initially interested in the 3% interest rate offered by Robinhood with their savings and checking account, but who knows if that's going to happen now. Ally has a 2% interest rate on their savings, and right now I make basically nothing on my savings account. I need to lookup my reoccuring payments and see if there are opportunities to cancel these and save some money. I believe these are obtainable tasks in the next week or so. I'll update you as I go! As you can see, my gains have gone done by over $1,000. In the long-run, things will balance out again, but as of right now, it's not fun to look at. If I'm able to contribute more money, I can buy more of the stocks/ETFs I own at a lower price, and increase the dividend yield (as long as the dividend doesn't get cut or reduced). I'm pretty close to reaching $100.00 in dividends for 2018, and I believe I will hit that goal this week. I also made a video talking about my dividends, seen below. I received $4.45 in dividends this week. I'm very happy with that! I'm hoping to stick with the dividend strategy and continue to keep staying away from options, as I obviously don't have the stomach to handle the large swings.